From Ottoman Turkey, where botany was used as a means of communication in harems, to Victorian England, where love feelings were a taboo and floral compositions became coded messages, up to present times: flowers are the most ancient symbol of romanticism. Also the fashion world has long seized this language: narcissuses, roses, peonies, wild flowers, daisies, poppies and tulips. Beautiful, elegant and available in thousands of colours. And it is precisely with floral patterns printed on satin, nylon and jacquard that we inaugurate the month of April, with their most alluring and feminine side, embracing the new season with the right spirit and colours, which are delicate and romantic like an ode to the joy of living. The key feature of these prints? The versatility and availability of patterns and materials. Also Wonderlandia, one of the three moods of Schmid’s new S/S 2020 collection, is inspired by this theme, whilst also giving it an innovative touch. Like in the Wall Papers Aqua and Venere: two satins, the first one being a chine satin with light colours and a watercolour-like floral print, while the second being an exquisite classic satin with a floral print, embellished with a poetic explosion of primary colours. With its 3D effects and flower power, Maui stands out in this trend: its macro-flowers on polyester give rise to a hypnotic and evocative pattern. Spring symbols triumph also among evergreen fabrics such as Melul, a satin decorated with stems, petals and corollas that recall the colours of the sunset. 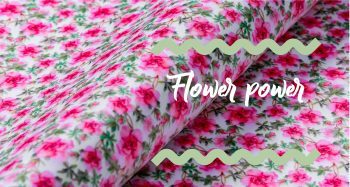 Let yourself be enchanted by the softness of these fabrics and discover the beauty of a blossoming garden.